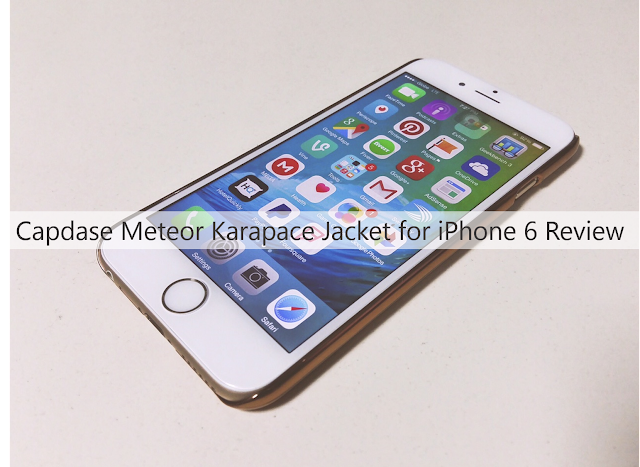 Check out our review for Capdase Meteor Karapcase Jacket Case for iPhone 6 and iPhone 6 Plus. Most of the flagship devices today are basically built with premium metal chassis. The likes of the iPhone 6 and all other Apple handsets that come before it are not exceptions to this rule. In fact, most of us do settle for our own handset's shell for its protection; in most cases, users of high-end smartphones find it necessary to stuff their phones inside a case. However, most of these cases alter the precious design of our iPhones. The Capdase Meteor Karapace Jacket Pouch and Case is one of the better choices that will preserve the thin form factor of your iPhone 6 and iPhone 6 Plus. In fact, it is the most popular among the consumers. We have been very lucky to have tested a review unit, check out our detailed review right after the jump. From one of the most trusted brands in the market, the Capdase Meteor Karapace Jacket (Case and Pouch) is intricately designed just for the iPhone 6 and iPhone 6 Plus. The case is packaged in slide-through box which is common for all the Capdase cases. The whole package comes with the case, a pouch and a screen guard. You might not need the latter due to the fact that iPhone screens are the toughest in the market, but for the scratch-conscious, it’s a welcome accessory. The one that we got has a rose-gold hue but the Meteor case comes with three other tones to fit your phone’s color. The Carapace Meteor Karapace Jacket is very thin. Snugging it into our iPhone 6 is very easy, unlike any other bulky case you have in the market. What I like about its design philosophy is that it comes with a glossy metallic frame accenting the sides of the case. It also preserves the iPhone 6 design knowing the fact that its rear panel is a clear cyber case. The case is quite sturdy, I tried intentionally dropping it at one-meter height, and it survived the fall without scratch. The Capdase Meteor case is cut with precision to give full access to the iPhone 6’s buttons and ports. There’s an oval-shaped cut for the camera, volume rocker and sleep/wake power button. Speakers, Lightning ports and Audio jack areas are also highlighted with the metallic accent at the bottom part of the case. It is also a breath of fresh air that the cringe-worthy protruding camera issue has been solved by the Meteor case. The two-tone pouch is also a welcome addition to the case. It comes with a soft interior which protects the iPhone and the case from foreign objects. It is sleek and matches the iPhone’s design, so there’s no need to worry about a fashion mismatch here. Capdase also see to it that there is full compatibility with other accessories once the Meteor case has been installed. Since it’s barely there, there’s an easy access to ports like the audio jack and Lightning port. However, like almost all of the iPhone cases, you need to get the phone out of the case when accessing the SIM tray. If you’re in the market for a clear case that won’t tamper your iPhone 6 design, the Capdase Meteor Karapace Jacket (Case and Pouch) is for you. It is sleek, durable, easy to use and it’s barely there. It has an asking price of Php 1,280 which is basically a good deal for those wanting to get an additional premium feel for their iPhone 6.